This year I embarked on one of the biggest adventures of my life & I was lucky enough to do this trip with my boyfriend & his friend. We spent two weeks exploring Vietnam, moving from the city of Hanoi in the north, sailing through Halong Bay & continuing right down to the city of Can Tho in the south & passing by Ho Cho Minh in the middle. Vietnam is a place of chaos. At first I felt overwhelmed, HOT, &… oh.. HOT again but soon I started to love the chaos. I realised that this trip would never have been the same without it & in a situation like this where I felt completely out of my European comfort zone I simply had to embrace it & that I did! In the end I loved Vietnam. My heart felt heavy leaving & landing back in a very calm Rotterdam in comparrison felt strange & slightly uncomfortable in itself. Looking back I have endless highlights of our trip. Hanoi brought fear & near death experiences as a small country Irish girl trying to cross a road of scooters, cars & no rules. Lucky for me I had two much more cultured guys by my side so I didn’t die. But Hanoi also brought Vietnamese beauty, temples, amazing coffee, laughter, food, lots & lots of food! Honestly we spent most of our trip eating & Hanoi gave us some of the best we had. As a vegetarian among two meat lovers in a country that undoubtedly loves meat & fish I found the process of finding food a little bit tougher but by simply paying an extra euro or two it made everything a lot easier. The food in Vietnam is beyond cheap so going to a fancier restaurant & paying for a 3 course high end meal with drinks was the same as going for just a main course here. If you want to live off 2 euro or less I’d say you probably could but for a decent vegetarian meal I would highly recommend skipping the street food & treating yourself to a restaurant meal. Vietnam only showed me how overpriced Europe really is! One of my most memorable meals happened to be in Hanoi. It was in a traditional Vietnamese restaurant called Cau Go, in the very centre of Hanoi & overlooking the Hoan Kiem lake. I remember we went here by accident & it wasn’t where I wanted to eat but I left that meal so happy we stayed. For the first three nights of our trip we stayed in a hotel called the Sunline Paon Hotel in the centre of Hanoi. I found this hotel on booking.com & the price for three nights, two double bedrooms, breakfast included, perfect location, a very small gym, & a small rooftop pool plus top class service & endless smiles was incredible! We payed €300 between us for everything & I cannot recommend the Sunline Paon enough. We visited places like the Temple of literature of Hanoi, the botanical gardens, the Haon Kiem lake & the Westlake. The botanical gardens are a bit of a miss but I would definitely recommend seeing the Westlake & the Temple of Literature. From Hanoi we organised a 3 day cruise trip along Halong Bay through our hotel. Our hotel organised the whole trip for us, including the transfers to Halong Bay, the payment, etc. This trip was my favourite part of our whole holiday to Vietnam. It cost us around 220 each for the whole 3 day cruise, transfers and food included. Drinks were not included except daily water bottles but that didn’t matter. The drinks were cheap. We spent around €20 each on drinks for the whole cruise, cocktails, water, coffee! The trip to Halong Bay was beyond amazing! It was my biggest highlight hands down. 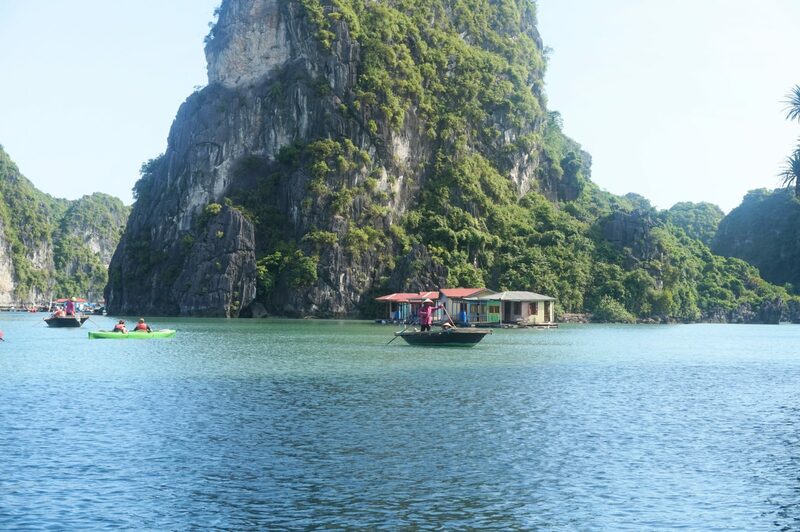 With barely any WiFi connection, cruising through the islands of Halong in the middle of nowhere, meeting new people, daily activities including kayaking to a beach to swim, a cave tour, sailing around a floating fishing village on a bamboo boat, BBQ’s, learning to cook with the natives. For what?! Less than €250. It was INCREDIBLE! In my next post I will fill you in on our adventures in the city of Can Tho & Ho Chi Minh plus a sneaky trip back to the Westlake in Hanoi where I treated Carlos to a night in a 5* resort for his graduation!